A new regulation bans smoking in public places starting October 2nd (today). Today is Mahatma Gandhi’s birthday. As a tribute to the father of the nation, this would come into affect from today. Leaving whether the ban is justified or not, it is a noble initiative nevertheless. Interesting thing is, it does not take any thing from the policy makers. It is just a law, sign it and pass it. No negotiations, no risk analysis, no nothing. Our government’s obsession with low hanging yet controversial fruits continues. Reservations are one of those things. This is the next thing. No cost involved, let’s implement! The noble cause of this initiative is to reduce the accessibility and thus save people’s lives. I don’t think the environment is on their agenda. If successful it would help the environment too. I am not sure if this will be a success in terms of reducing the deaths. People will still try to find ways to sneak and to smoke. The law says smoking in public places is banned. Public place by definition is debatable. Is Road a public place or not? Can they smoke on the road? Would this cause people to smoke more (like 2 or 3 cigarettes at a time) because the opportunities are limited? Only time will tell the answers. What the ban would do is, kill the mini entrepreneurs who set up shop opposite to the offices and sell cigarettes in retail. I feel for them. Most of them might not be smokers but it’s still affecting them. 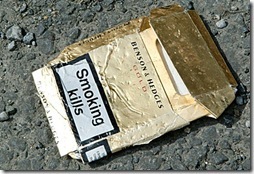 Tobacco products are their main source of revenue. 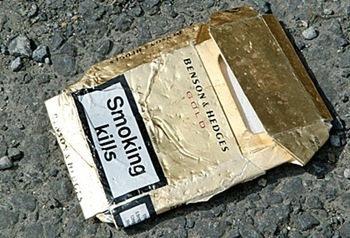 Smoking deaths on 2nd October 2009 would be an interesting read. Whom would this ban affect? 3. Mini entrepreneurs right next to your office who sell cigarettes in retail. Who would gain from this? – Kids who sneak and smoke. Police (cops and traffic guys) will benefit enormously from this ban. Do I need to explain why? I think we all know but let me just mention it for completeness. This would be one more opportunity for extracting bribes and fill their pockets. Let me stop at that. Bollywood is divided on the issue. They think smoking should be banned in public places and not in movies. How funny? I think most of the kids start smoking by imitating their favourite actors. So if there is a place where smoking has to be banned that should be in movies. You next puff might cost you 50 bucks. I think that it is true that smoking is bad for your health, and it is bad for the health of the people around the smokers. I think that banning smoking in public places is a good idea. Its absolutely ridiculous , wile such an effort is being made to understand the feelings of non smokers , smokers on the other hand are eing made to feel like 2nd class citizens honestly..
Why not allow people to open “Smokers only” pubs,bars etc…if you want to be democratic, swing it both ways.. I think it is good that at least the law has been passed.